Our tree moving process saves hundreds of trees per year. How is that possible over the old hand-dug method? First: The compound form and angle of the spade, somewhat like a spoon, makes for a more compact root ball. Second: The precise cutting nature of the mechanism and the fact that the spade can carry the tree with minimal disturbance means that precious roots and root hairs remain contacted with the nutrient and moisture rich soils. 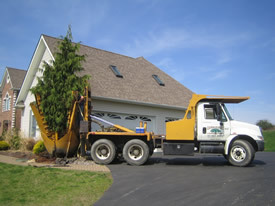 The 90″ tree spade needs a minimum of 8.5ft to 10ft in width to be able to drive up to the trees and to the delivery destination. An underground utility locate should be done prior to scheduling. Are there any overhead wires close to the trees? Are the trees close to any obstructions (i.e. foundations, concrete, curbs, asphalt, etc)? When these areas are an issue, our spades can drive on protective mats to help protect property. When access is a question, we provide onsite evaluation.